Deputy editor and environment editor, Sandi Keane, takes a look at what is driving global speculation known as “land grabbing” and the message to Australia as we head towards an election. IN THE FIVE MINUTES it takes you to read this, powerful interests around the globe will have hoovered up large tracts of agricultural land equivalent to fifty MCGs (or ten every minute). Land grabbing – and its other prime objective, water grabbing – is a bid to secure food, water and energy requirements by wealthy countries, corporations, investment funds and (generally) unscrupulous individuals. The “grabees” are for the large part developing countries in the sub-Sahara, Asia and Latin America. 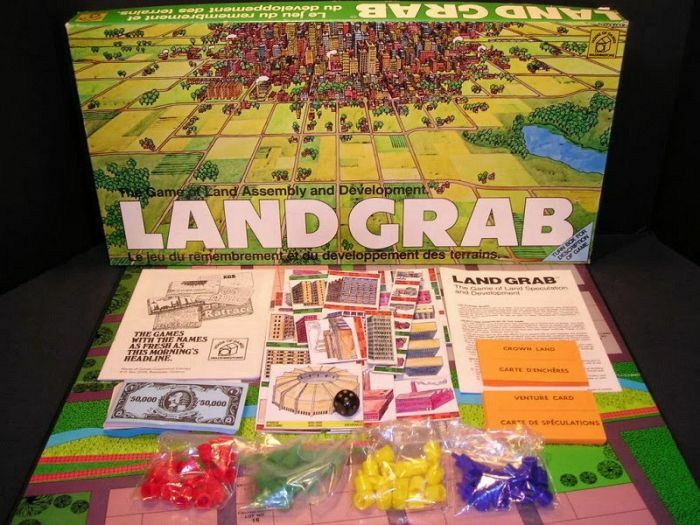 The phenomenon of land grabs (large-scale land acquisitions) is yet to register a blip on Australia’s media radar, but the trend is highly relevant to the current controversy about mining on Australia’s prime farm land with food, now the new oil, and land, the new gold, (as detailed in this author’sinvestigation ‘Australia’s CSG industry – no longer such a gas’). According to a study by the National Academy of Sciences of the USA, the land grabbing phenomenon has already claimed over 80 million hectares – an area twice the size of Japan – or enough to feed 80 million families in India. In 2009, an initiative called the Land Matrix was set up to build a constantly evolving database on large-scale land acquisitions. To get any idea of the escalation of this offensive since the food price spike in 2008, a visit to this site is essential. The deals ranged from areas between 10,000 and 200,000 hectares. According to the anti-hunger group, Oxfam International, more than sixty per cent of these “land grabs” were in poor countries. Liberia, for example, has lost thirty per cent of its land in just five years. GRAIN, an NGO supporting small farmers, is reported to have seen proposals that would allow Saudi business groups to take virtual control of the total rice production in Senegal and Mali. 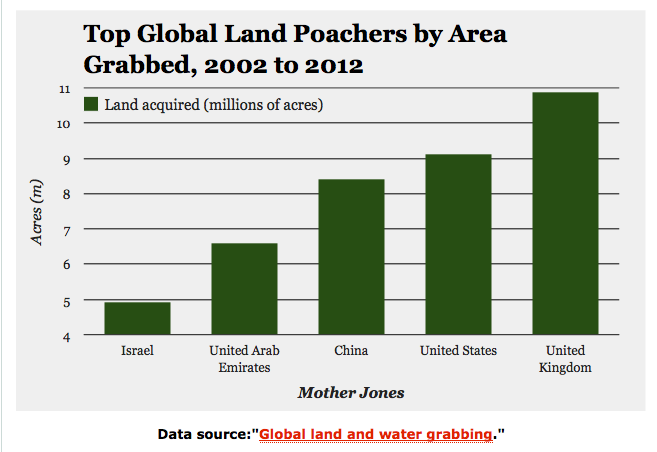 The top five land grabbers, according to a report in Mother Jones earlier this year, are UK, U.S.A., China, United Arab Emirates and Israel. Many of the purchases, according to Mother Jones, are carried out by private equity funds, university endowments, pension funds, and hedge funds looking to capitalizing on the world’s declining food, water and natural resources. And the deals are being generated at rapid speed as investors scramble to get a slice of the action. Small wonder. The land is bargain priced, minimal tax applies and investment returns of 20 per cent plus represent a return to pre-GFC days. In some cases, the new land barons simply sit on the land as savvy speculators and wait for its value to skyrocket. The tragedy is that it’s the corrupt governments of third world countries who are easy prey. Local communities are promised jobs, schools, clinics and other social infrastructure but, as aid groups like GRAIN has shown, these rarely eventuate. As the new foreign landholder generally pays less tax than the previous tenant, little benefit flows into the public purse. With no access to the land they relied on to produce food and make a living, the economic consequences for the local community are devastating. Aid agencies like Oxfam are rightly concerned. When the local farmers are kicked off the land, there’s no food produced to feed the local population. With one in eight people in the world going hungry, Oxfam argues that these land deals could feed one billion people. The World Bank is a key player in foreign land acquisitions as funder, government adviser and regulator. At the height of the global food crisis in 2007/2008, it was hard to spin the funding of land deals as a solution to the food crisis when dispossessed peasants no longer had the means to sustain themselves and most of the food produced was exported. Even the Economist started declaring it blatant “land grabs”. Critics, such as the director of the UN’s Food and Agriculture Organisation, dubbed the practice as “neo-colonialist”. Neo-colonialism, like its close relative, globalization, is about free marketeering, the catchcry of the neo-liberal movement. The bank responded with a new set of principles: Principles for Responsible Agricultural Investment. But aid agencies complained that the principles were too weak and that this was just a front to legitimise land grabs. Oxfam’s September 2011 briefing paper, ‘Land and Power – the growing scandal surrounding the new wave of investment in land’, looked at five land grabs in Uganda, Indonesia, Guatemala, Honduras and South Sudan. It concluded that adoption of international standards on good governance was a clear imperative at a number of levels to lessen risks to local communities and improve environmental outcomes. The resulting campaign by Oxfam and aid agencies around the world forced an agreement by the World Bank in April this year to develop new measures to tackle land grabs by unscrupulous investors. But to the disappointment of the NGOs, the bank opted not to freeze its large-scale agricultural investments until such measures were introduced. Oxfam is now calling on the public to use the power of social media to pressure the bank into immediate action. So, apart from calling on our government to join Oxfam in condemning land grabs at the G20summit in September this year, are there any lessons from the global Land Rush for Australia? There has certainly been no let up in the pitched battle between farmers and CSG miners, especially in the high yield cropping regions of the Liverpool Plains in NSW and Cecil Plains in Queensland. In Victoria, as a result of the LNP government overturning the former Labor government’s shelving of mining licences, eighty per cent of Gippsland – Victoria’s prime agricultural land – is now under licence. The moratorium on fracking is about to end and Victorian farmers are deeply concerned about the, as yet, unknown implications to crucial water aquifers. Real action on food and water security is unlikely as State governments scramble to fill their treasury coffers with mining royalties. 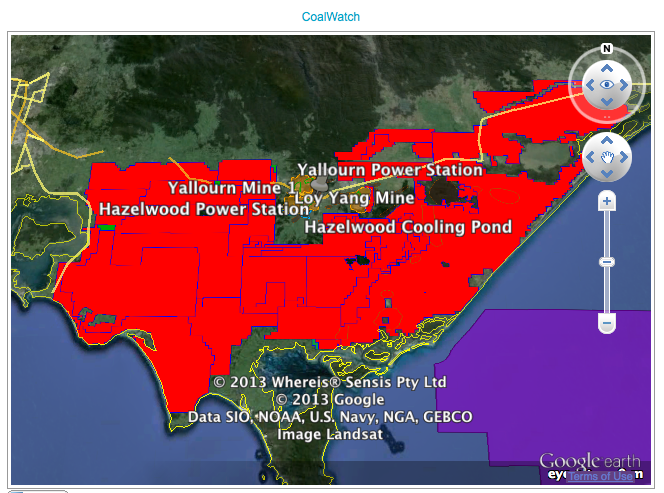 At the federal level, both the government and the opposition continue to support expansion of Australia’s fossil fuel industry, including the controversial experiment being played out by CSG miners. A major concern is that the areas slated for CSG production are directly above the Great Artesian Basin, one of the world’s largest natural underground water reservoirs covering about 22 per cent of Australia’s land mass. The lack of real bipartisan political action on food and water security is now set to spill over into the federal election campaign. The Greens and Katter’s Australia Party are looking to capitalise. Both are fielding candidates in all 150 House of Representative seats as well as in the Senate and are vowing to take on mining interests to ward off CSG from fertile cropping land. The take-home message from the global Land Rush is this: if the lure of agricultural riches is such that powerful interests are prepared to violate people’s rights and destroy their livelihoods in the process, why aren’t we having a proper debate in this country about Australia’s future food and water security in a warming planet versus more coal and CSG exports? published on Independent Australia 14 July 2013.